less tar and up to 713 less nicotine. All-American Pipe. Red and blue stripes. Pot shape. 87 N7326-Shipping weight 4 ounces. Pipe Rock™. Great conversation piece for home or office. pipe cleaners, matches, too. Pipes not included. need no breaking in. Heavy enamel finish resists cracking. stem pipe. Finest briar bowl. Gift boxed. 87 N7295-Shipping weight 8 ounces . .
and Dublin shapes. Italian briar base with metal holders. 2 aluminum shanks, bits. Air-cooled moisture trap. 87 N7256-Shipping weight 12 ounces . . . . .
Corn Cob Pipe Set. 7 popular shapes. Boxed. 87 N7217- Shipping weight 1 lb. 8 oz. .
plus handy pocket tool. Boxed. Imported from France. 87 N72 11- Shipping weight 8 ounces. cool, mild smoke every time. Imported from Austria. Executive Set. Molded meerschaum; Algerian briar with cup. Block Meerschaum. Hand-carved bowl. Fitted case. Molded Meerschaum. Giit boxed. Shpg. wt. each 4 oz. O il-cured Meerschaum. Molded bowl. Shpg. wt. each 4 oz. 4-pipe Rock, Humidor. Walnut-fini shed hardwood rack. Glass humidor for 1-lb. tobacco. 10x6Y2x7 inches high. Pipes and tobacco are not included. plated0posts. Glass jar, walnut lid. Moistener. high. Pipes and tobacco are not included. rack with brass posts. Glass jar with walnut lid. Moistener. in. high . Pipes and tobacco not incl. 87 N7403- Sh ipping weight 2 lbs. 8 oz.. . . . .
87 N7400-Shipping weight 2 pounds. .
pigskin. Matching pigskin pouch. Gift boxed. 87 N7298- Shipping weight 8 ounces . Pipe Knocker Ashtray with pipe '.est. holder on rim. 7%-inch diameter. Pipe not included. Deerskin Pouch. Tan color. 6Y2x3Y2 in. high. Kew Zealand. 5-job Pipe Knife. Stainless steel. Leather case. sion wheels. Steel, plastic .. rubber wheels. 11 in. long. Red . From W. Germany. 3 in. high. Chrome-plated steel. Gold-color metal, lizard trim . 87 N7011- Postpaid. (Wt. 4oz.). plated barrel and trim on lighter. 87 N7032- Shpg. wt. 1 lb.. .
ordering's a quick and easy way to buy it. sides. Holds 50 cigars, sold below. or without filters. Order tubes, tobacco, below. 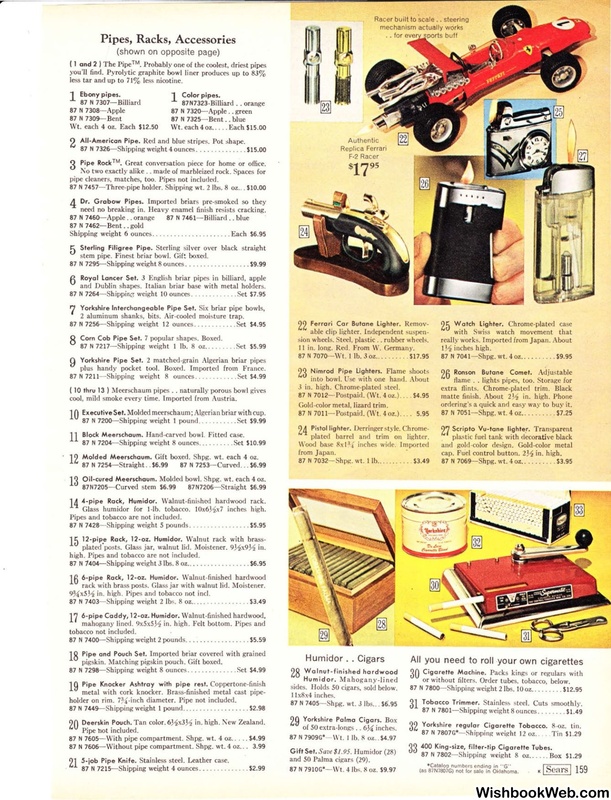 Tobacco Trimmer. Stainless steel. Cuts smoothly. Yorkshire regula r Ciga rette Tobacco. 8-oz. tin. King-size, filter-tip Ciga rette Tub es. •Catalog numbers ending in " G"
not for sale in Oklahoma.